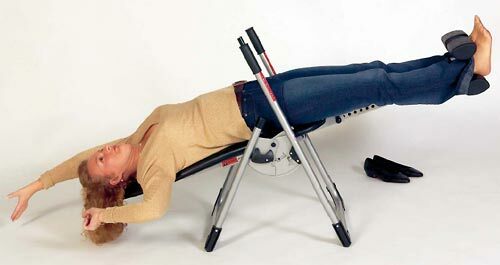 Master Care MINI Home Inversion Back Therapy Table Back-A-Traction. The Moving back-rest™, that responds to your body movements while doing a few simple therapeutic exercises, makes it possible to increase the effect of natural decompression and improve the blood-circulation. In general it renders a decompression throughout the entire body. The concept of natural decompression of discs and joints in combination with simple therapeutic exercises in 15º inversion has been developed together with experienced medical doctors and physical therapists in Sweden. 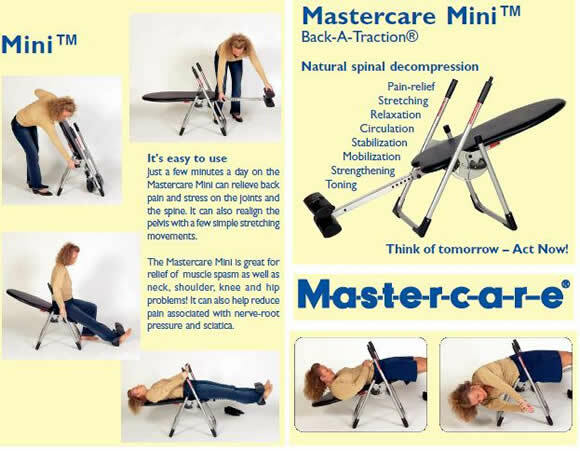 Studies prove that Mastercare Back-A-Traction is of great aid in any back related problems. Try yourself – now you can take control of your pain – No need to suffer any longer! If you have any questions regarding this inversion table please give us a call at (800)355-2956. It's easy to use Just a few minutes a day on the Mastercare Mini can relieve back pain and stress on the joints and the spine. It can also realign the pelvis with a few simple stretching movements. The Mastercare Mini is great for relief of muscle spasm as well as neck, shoulder, knee and hip problems! It can also help reduce pain associated with nerve-root pressure and sciatica. Prevents and effectively treats back, neck, shoulder and knee problems. - Adjusts to heights up to 215 cm / 7'5"
- Dimensions folded: H:124 cm/48,8" W:21 cm/8,3" L:53 cm/20,9"